We love riding and competing in endurance races in the South. The folks, as a group, are friendly and genuinely glad to see new comers. The vets are used to seeing alternative breeds other than Arabians. The location of the ride is Chester GA. It is so tiny that it could be a suburb of Mayberry. It has the claim to fame of having been the home town of Pretty Boy Floyd. I mean the famous criminal, not the speed racking horse. It seems that Floyd left town for greener pastures. In a classic southern tradition not unlike direction advice that starts with, “turn where the tavern used to be”, the ride is named after a red barn that is no longer on the property. The ride site is owned by the Perry family. They own all 4000 acres of the ride site, and this ride is the only time the family place is open to the public. Camping is great but rustic. There is a water spigot and you have to haul water back to your trailer. The Perry’s own an off site winery, and they offer wine and wonderful concoctions they call “slushies” that many women, including my wife Sandy, loved. Both the Friday and Saturday evenings were catered as a part of the ride fee. Friday night was barbecue chicken and Saturday night featured barbecue ribs. The Perry’s are great folks and they turn the dinners into a Mayberry- like impromptu skits where they end up making fun of their relatives or friends. The top awards feature things like hand-made wooden giant rocking chairs and mounting blocks. The vets included Otis Schmitt, Ken Marcella and Dee Dee Huff. Each of the 4 rides had about 60 entries. The trails are flat, fast and often a bit sandy. Each road crossing is manned and the crossing guards are usually the Chester volunteer fire department or friends of the Perrys. This is one of our favorite rides and I urge you to try it. It is always great to see the Angie McGee family, Joe Schoech, and the other SE riders. We had to haul 11 hours to get there and that means getting up at 3:30 am. My plan was to ride my sweet heart twh mare Kate both days, and take the twh Jazz as my back up. Sandy took one of her twh mares Cheyenne. I loaded the horses in the dark and off we went. Shortly after leaving, the dash cluster on our 2007 Ford diesel 250 went dark and the gauges went dead and the battery light came on. The motor did not die and when the gas pedal was tapped, the power came back on. This happened on and off for the whole trip. It meant you could not really listen to the radio and required us to go to a “happy place” as we drove. This is an equestrian event not to be missed. It is an unbelievable event with much to offer for everyone. We even attended with our 15 month old son and had an absolutely fabulous time. 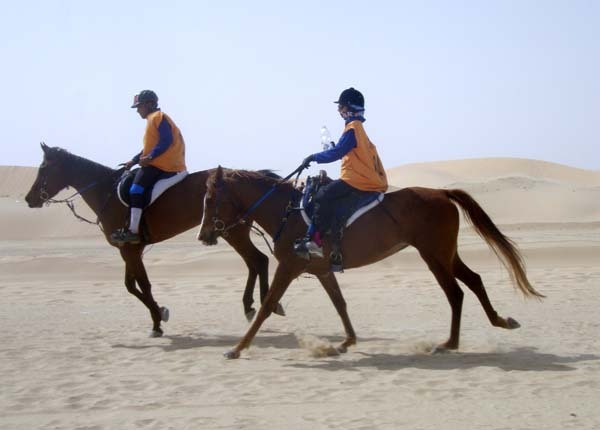 It is truly a celebration of the Arabian horse within the UAE heritage. This magnificent festival reminds you how honored and privileged we are to be able to ride such an exquisite animal. The festival was from March 1 - 10 and included the World Arabian Breeders Challenge, Riding show classes, Dressage, Equestrian Games for under 10 years, and a fantastic variety of Endurance races and Show Jumping. The weather was fantastic!! Next time you are looking for a beach vacation consider Abu Dhabi, as there are beaches, city life and equestrian events to enjoy!! Not to mention lots of endurance racing. The camel races are something to experience as well. It is an amazing experience. It gives you more of an understanding how driving alongside your endurance rider may have begun. The camel races begin with a mass start (the starting area can accommodate up to 80 camels). 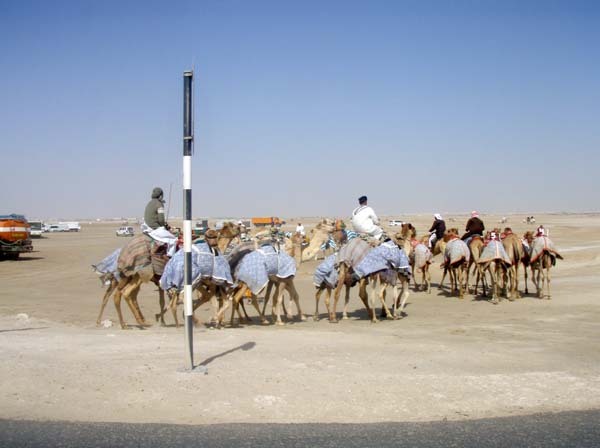 The gate lifted and approximately 30 camels blasted full speed (up to 40km/hr) out from behind the gate. They are all controlled by electronic jockeys (no live persons). As the camels gallop down the track the owners and spectators alike race along the track fence in their car enjoying the race up close. It is a real thrill. We went around the track for several races and then enjoyed another option for watching. With this option you can enjoy the races from your car on a large drive-in movie theater screen, while viewing the camels, which are followed by a camera! A great treat with this option is enjoying Arabic tea or coffee served by Arabic men directly to your car window. There is also a grandstand where spectators may watch. Unfortunately, we missed a highlight I was personally looking forward to and that was the Arabian racing at the track. This was something to be seen, but for such an intense trip I am not too disappointed as that was the only event we had to miss. Never wake a sleeping baby, right? 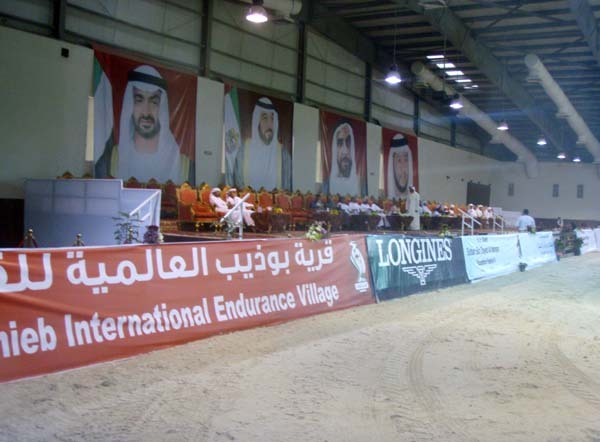 Boutheib International Endurance Village is spectacular. There was an exhibition with booths of the Arabian heritage, the Royal Family, UAE wildlife, tack shops and much more. As guests of H.H. Sheikh Sultan Bin Zayed Al Nahyan we were honored and privileged enough to be able to personally meet him. He is so incredibly kind. He had us treated like royalty. The endurance races are incredibly easy to spectate. The vet gate, the sheltered crew areas and finish and start are all in one area making it possible to see absolutely everything. The horses are amazingly fit, they go at great speeds and look fantastic at the end. The trainers and riders over here do this full time and it shows! In the dining Tent the meals were sensational and served with a tremendous amount of gold and beautiful china. The tables are all immaculately decorated and everything is set upon gorgeous Arabic rugs. There are even wall murals hung around the royal table. The royal table is in a gigantic C shape with H.H. Sheikh Sultan Bin Zayed Al Nahyan at the center and his royal entourage and personal guests around him. The room is also filled with many circular tables to accommodate many, many more. The food is incredible with hors d'oeuvres too pretty to eat, main dishes of lobster, several different kinds of fish, traditional Arabic chicken and too many salads to even mention and then of course dessert. A meal truly fit for a King. The show jumping was also exhilarating to see. H.H. Sheikh Sultan bin Zayed Al Nahyan's son is an excellent jumper. The enormous indoor arena held the show where some excellent jumpers were shown. Their riders guided through a tough course of jumps against the clock. The footing was something to note. There was no dust. It consisted of sand with other synthetic materials and it appeared to make very superior footing. We were lucky enough to receive a guided tour through Wrsan stables. This is something we will also never forget or for that matter probably ever see anything greater. The entrance is heavily guarded and rightfully so. Upon entrance one can see that the desert area has been turned into a wildlife and horse paradise that is so beautiful and incredible to see it will be in your memory forever. The flower and greenery gardens are breathtaking as you drive through the grounds. We visited the breeding stables first. The horses all enjoy lush green paddocks and air conditioned stables when needed. Each stable also has a built in natural air conditioner. Quite interesting to see, it works by natural airflow and is quite cooling. I stood under it in front of the famous Monarch AH's stall and could feel probably a 5 - 10 degree difference in temperature. By the way, the stalls are really like indoor paddocks they are so huge. A wonderful place to be a horse. Miss Deirdre Hyde had a most impressive parade of horses for us to view. We saw the most famous and beautiful Arabians from around the world. A few of this and last year's wonderful foals were also shown. It was unreal. The endurance and race stables were just as amazing. The facilities were absolutely the most fantastic training facilities one could ever dream (a trainer's dream)! There was the swim training pool, the underwater treadmill, the outdoor exercisers (one even air conditioned), the indoor arena, the impeccably man-made groomed mountain and 5k trail for the endurance horses with man made hills and the most unbelievable training track you will ever see. There was even an graded incline dirt track approximately 3/4 mile long. The training track is about 2 miles with an additional mile of turf and dirt training tracks also attached. Absolutely unbelievable unless you see it. The falcon building is another sight to be seen. This is like a super dome just for training the falcons. Really spectacular! The falcons definitely live in luxury like the horses. There is 24 hour surveillance over the hatchery for these very difficult birds to breed. In the entrance of the super dome is a museum of the falcon quite interesting to see. There are also exotic wildlife areas throughout the property. Your eyes just grow bigger and bigger, there is just so much to see. The hospitality and kindness is a wonderful experience and nearly everyone speaks English. The road signs are all in Arabic and English. It is a very friendly city. We cannot thank H.H. Sheikh Sultan Bin Zayed Al Nahyan enough for this remarkable experience.